This used to be a B&B and it was the subject of a documentary done by a psychic (who is apparently also an actress and “media personality”). Supposedly the land that this house was on was once Indian tribal land and in the documentary they claim they found loads of old bones on the site (I am surprised that didn’t hold up construction). There is also no real explanation why, if as is alleged, thousands of people died on this land the hauntings are all confined to this specific one-tenth of an acre in the subdivision and doesn’t extend to any of the houses on either side, but in any event, this place is alleged to be haunted by tribal ghosts who died from disease brought to them when white settlers first arrived. 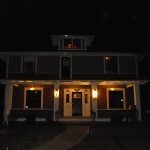 My friend lives in that house and she says its not haunted!!!! I was one of the investigator who spent 4 days and 3 nights in the house while filming a Documenrty. The house did have its share of strange anomalies. On the Third day of our filming Chief Roy Wilson from the local Native American tribe, did a releasing of the souls ceremony. Chief Roy is also the Shaman for the tribe. I don’t believe any spirits remain, but if they do, it’s because they feel at home there.